A 12-picture day! – lots of memorable food, including a Father’s Day treat from R, of course. I have a semi-choreographed ballet of ingredients-to-use-up, of which dinner was a part, but I can never keep all the elements of it in mind at the same time 😉 Had arugula and extra prosciutto, which manifested themselves on a pizza two nights ago, and at some point I remembered this recipe, too. 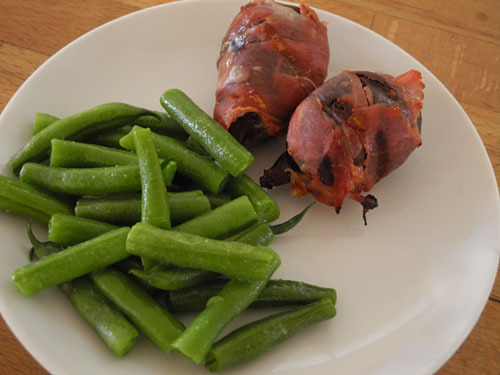 The actual recipe, which I reported here, has “speck” – smoked prosciutto – instead of the regular kind that I had, so I cooked the torn prosciutto pieces in olive oil very briefly tonight, instead of using them without cooking. 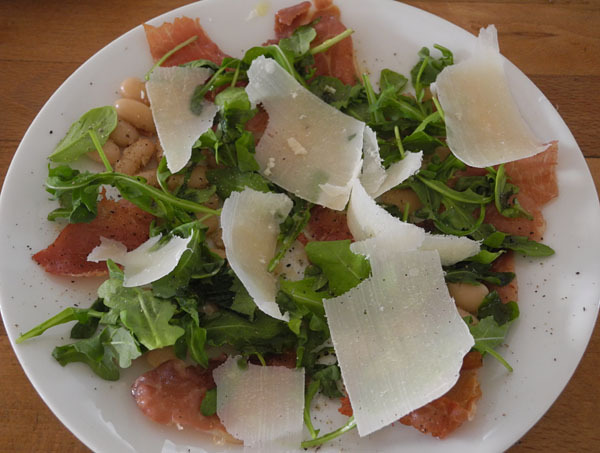 The rest of the recipe, including cooking the dry cannellini beans, is at that link – basically: arrange prosciutto, cooked beans, and cleaned arugula on plate, shave parmaggiano (or in this case, Grana Padano again) over the top, drizzle on olive oil (I used about 2 tsp/serving) and grind pepper over the top. I also prepared and steamed the last of the green beans from last week, and then emptied the pan and melted a bit of butter in it, returned the beans and salted them, tossed them about, and let them stay warm (on Low) till dinner was ready a few minutes later. I used up about 2 more slices of prosciutto (only 2 left, which I will use tomorrow) wrapping figs in them. I cut slices in the sides of the last four figs from the farmers’ market 8 days ago, and put a chunk of gorgonzola dolce into the fig, and then pressed it closed again. I wrapped each fig in 1/2 to a bit more of a slice of prosciutto, and then grilled them, starting with the split side of the fig down, so that once the cheese had melted, the crack through which it could escape was not pointing down any more. I cooked these 4 minutes on the first side and 2 minutes on the second, then turned off the grill (indoor, range grill) and let them cook a bit on the remaining two sides while I got everything else ready. 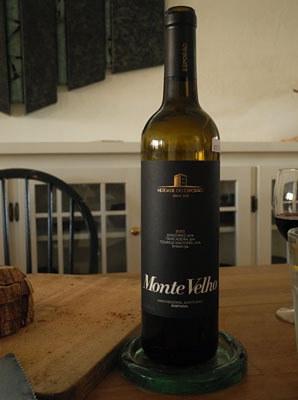 We had the end of the Morell’s Country Batard (I froze three slices) and another wine from The Wine Mine ($11.50) that we’ve had before – Mont Velho 2013, a combination of grapes called Aragonez, Trioncadeira, Touriga Nacional, and Syrah. It didn’t care for the sweetness of the stuffed fig, but overall it was good. We have more. 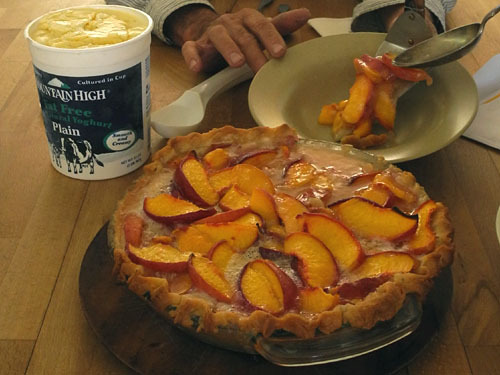 R brought over a peach pie, with sweet, butter crust. 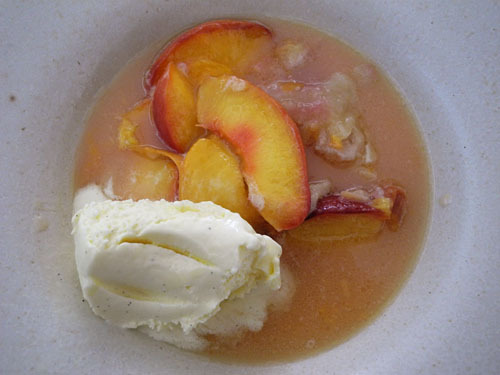 The filling had not firmed up at all, so “pie” isn’t what it looked like in the dish (bowl) but he had also made some vamilla bean ice cream, and the peach and crust made an outstanding ice cream sauce 🙂 Quite delicious! D chose some bowls by Lindt-Stymeist which are now extinct, alas. We have both white flecked (above), and a tan color (below) both of which went outstandingly well with these little cocktail napkins, so I couldn’t resist taking them out for a rare use. 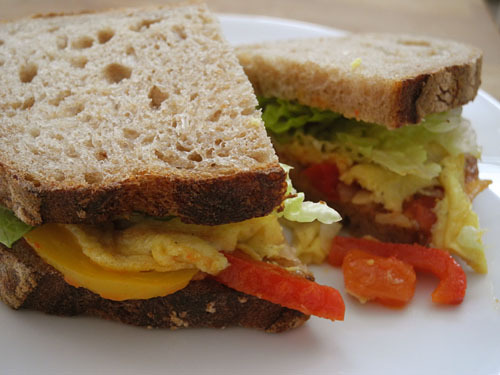 Moving back to lunch… D and I had sandwiches using some more of the piperade, on the Morell’s Country Batard, along with one egg which I scrambled with milk, salt, and pepper, and then cooked in butter in the smallest frying pan, so half of the flat, cooked egg just fit each sandwich 🙂 I added some romaine, but no condiments other than the piiperade. The sandwiches were outstanding! 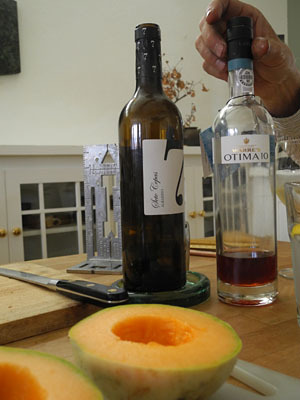 The other bottle in the picture is a port, Otima 10, which we (also) got at a Wine Mine tasting. 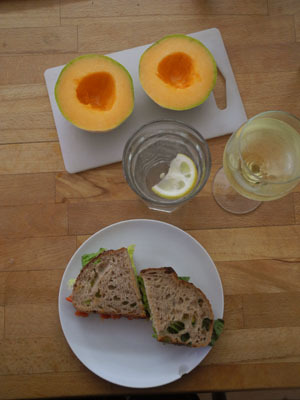 D served it in the well of the teeny “Charantais” melon he got at the Grand Lake market yesterday. 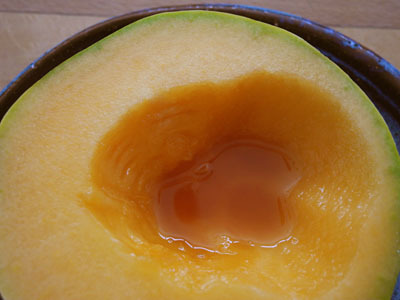 These are really spectacularly sweet and delicious melons! 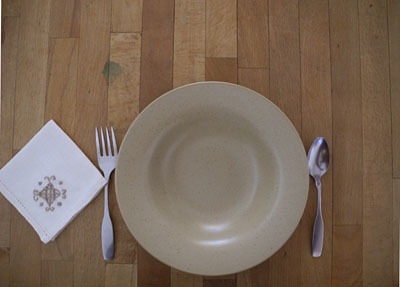 Finally back to breakfast, which I include b/c I had toast from the Morell’s loaf. 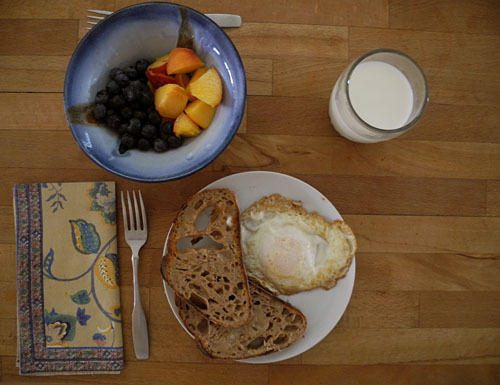 Very good toast, with fried egg, a glass of milk, and a bowl of peach chunks and blueberries. Luxury! 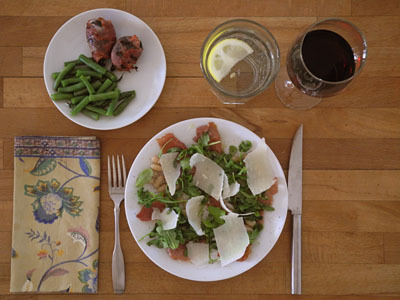 This entry was posted in Beans, Prosciutto, Salad and tagged Albarino, Arugula, Blueberries, Cannelini beans, Cheese, Eggs, figs, Fried egg, gorgonzola, Gorgonzola dolce, Grana Padano, Green beans, Ice cream, Lindt-Stymeist, melon, Peach pie, Peaches, Pie, Prosciutto, Red table wine, Sandwich, Wine Mine. Bookmark the permalink.